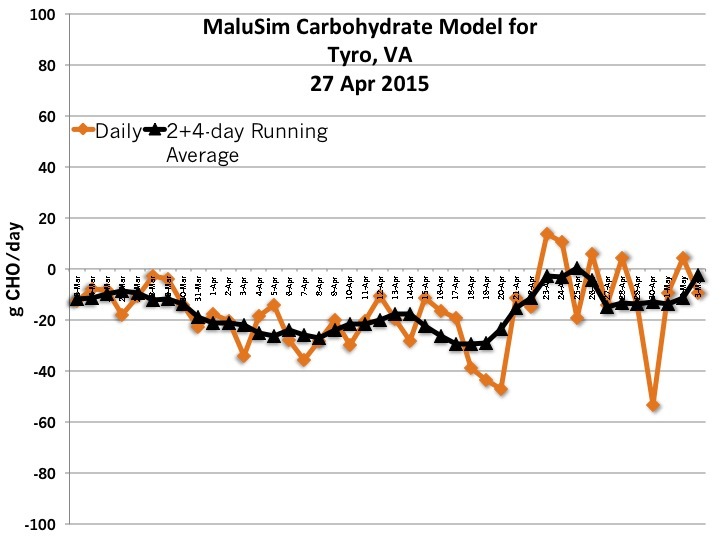 Today, I ran the first Central Virginia MaluSim model for 2015. I will start the Winchester models later this week. For Central Virginia, I use data from a weather station set up at Silver Creek Orchards and managed by my colleague, Dr. Mizuho Nita. A big thank you to Dr. Nita for allowing me to install the necessary instrumentation and for maintaining the station and associated software. This year, I will be using forecast data from the National Weather Service. In past years, I used Intellicast.com data because they provided 10-day forecasts with cloud cover predictions. Intellicast no longer provides the cloud cover data in an easy to use format, so I am switching to the National Weather Service’s forecasts. Note that these forecasts only project five days into the future. We will discuss the details of the model at Tuesday’s meeting at Saunders Brother. However, this first model run suggests that the relatively cool weather, and mostly sunny weather that has occurred since bud break has resulted in a moderate carbohydrate deficit in apple trees. Growers can expect average results from chemical thinners applied the last couple-few days through to the weekend. In blocks where significant thinning is needed, growers should apply carbaryl at petal fall and then look to the warmer weather that is predicted for the weekend and early next week for their 10 mm application. I will be meeting with Bennett Saunders and a few other growers at Saunders Brothers’ Cub Creek Orchard this coming Monday to discuss pruning strategies for tall spindle and other high density orchards. This will be a fairly informal meeting oriented towards group discussion and demonstrations. For those who can make it, we will meet at 10AM just inside the gate near the entrance of Cub Creek Orchard located off of Carter Hill Lane, Roseland, VA. It looks like it’ll be decent weather, but the ground might be a bit wet. Bring your own lunch, loopers, boots, etc. UPDATE (Sunday Feb. 22): This meeting is still scheduled to proceed as planned. However, only four wheel-drive vehicles will be able to drive further than the orchard entrance. We will coordinate carpools at 10AM. 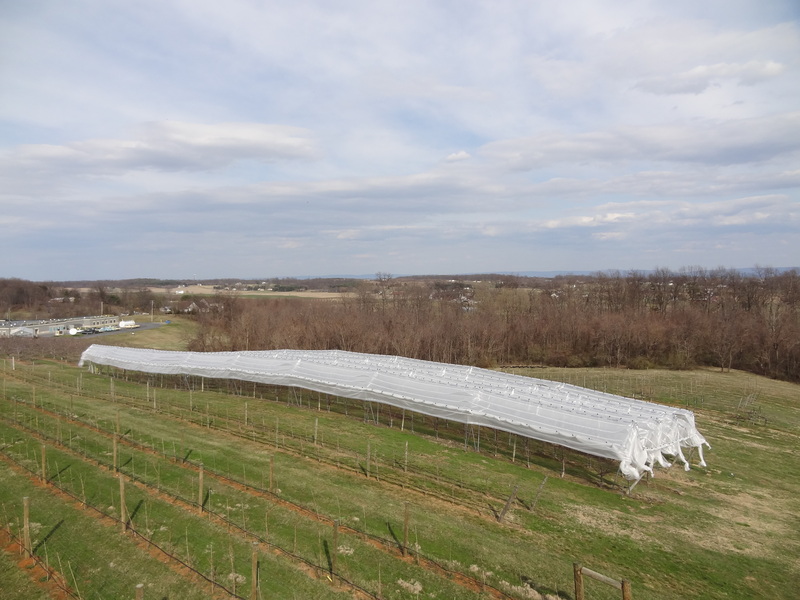 The fifth in-orchard production meeting of the 2014 Central Virginia Orchard Meeting series will be held on Tuesday, June 3rd at 11:00 a.m. at 7 K Farms, located at 837 Red House Rd, Rustburg, Virginia 24588. The event is hosted by farm manager Bill Beni and the rest of the staff at this most interesting entrant into the Virginia fruit industry. It is open to all but will be especially interesting to new and established fruit growers, people considering conversion of some of their acreage to higher value crops, and regional decision makers. You will have an opportunity to tour the farm and have your questions addressed by our hosts and Drs. Chris Bergh, Greg Peck and Keith Yoder, Extension tree fruit specialists based at the Alson H. Smith Jr. Agricultural Research and Extension Center near Winchester. 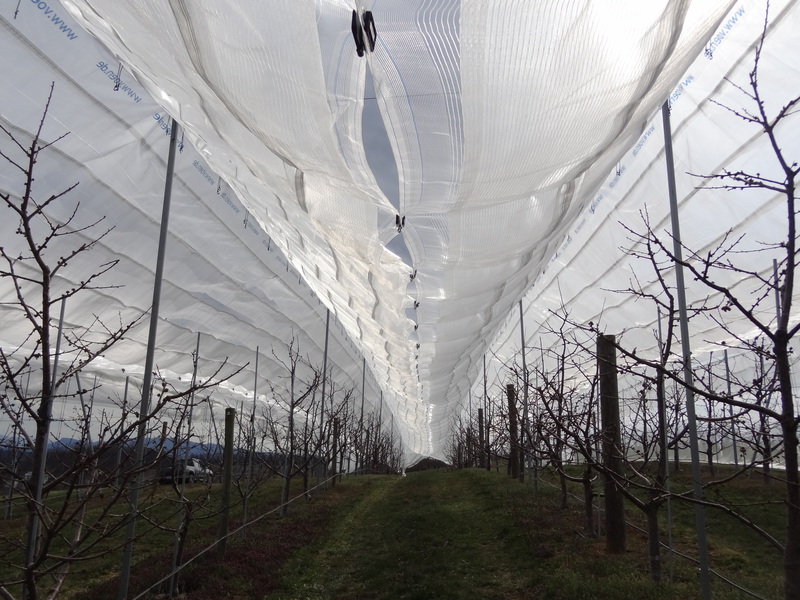 If you are bringing specimens of insects pests or plant disease for diagnosis and control recommendations, please follow good sanitation practices by putting the material in sealed plastic bags and properly remove your material away from the host orchard after the meeting. A nice lunch for everyone is being prepared plus water and other cold drinks will be provided that day. Register by Thursday, May 29. To assist us with our planning Please contact either Lucinda MacRae at the Nelson County Extension Office: 434 263 4035 / lmacrae@vt.edu or 7 K Farms main office. Your contact there is Melanie Mahone, (434) 332-4460 / mel7kfarms@centurylink.net. Directions from Lynchburg: Rustburg is located southeast of Lynchburg. Take Route 501 off of Highway 29 and continue 10 miles to the stoplight in Rustburg, turn left onto Hwy 24 toward Concord and travel 0.5 miles to the next stoplight and turn right onto Red House Road. Travel 0.8 miles to the farm entrance, extra signage will be put up to help you. If you are a person with a disability and desire any assistive devices, services or other accommodations to participate in this activity, please contact the Nelson County Extension Office at (434)263-4035 to discuss accommodations five days prior to the date of the meeting. rootstock cut above the dormant scion bud and stored for planting in a nursery or orchard. Due to the quick progress of our trees this spring, our third orchard production meeting of this year HAS BEEN MOVED FORWARD TO THIS THURSDAY, May 1st. We will be meeting at 11:00 a.m. at the office of Saunders Bros. Nursery, located at 2717 Tye Brook Hwy, Piney River, VA 22964; Tel. : (434) 277-5455; http://www.saundersbrothers.com/. Bennett Saunders will be our host. A special focus of this meeting with be crop thinning considerations provided by Extension specialist Gregory Peck. In addition, Drs. Yoder and Bergh will be on hand to discuss disease and insect pest issues, respectively. Please come to discuss fruit production issues and concerns with other fruit growers and Extension fruit specialists. You are encouraged to bring plant and insect samples for identification, but please have these contained in a plastic bag. Please bring your own bagged lunch to this meeting. Cold drinks will be provided by the host orchard. If you are a person with a disability and desire any assistive devices, services or other accommodations to participate in this activity, please contact the Nelson County Extension Office at (434) 263-4035 to discuss accommodations five days prior to the date of the meeting. Please make plans to attend the Pre-Harvest Orchard Meeting on Wednesday, August 14th, at the Drumheller Orchard, south of Lovingston, Va. We will begin the informational portion of the program at 11:00 a.m. Please bring a bag lunch for the meeting. Dessert and beverages will be provided. Topics at the meeting will include the current status of pests and diseases and maximizing returns through harvest quality and storage considerations. At the main entrance to the Nelson County High School (construction in progress) turn right and make an immediate left on Route 741 (Drumheller Orchard lane) and proceed roughly ½ mile to the end of the road. The next in-orchard meeting will be held on Wednesday June 12 at 11AM in Fauquier County at Stribling Orchard with a post meeting visit to Heartland Orchard. For more information, contact Kenner Love: klove@vt.edu or (540) 675-3619. On June 18 at 11AM, we’ll be meeting at Tommy Fitzgerald’s Orchard in Central Virginia. The address is 621 Dillard Hill Road, Lowesville, VA 22967. The main office phone number is (434) 277-5051. For more information, contact Michael Lachance: lachance@vt.edu or (434) 263-4035. At both meetings there will be updates from Dr. Peck (horticulture), Dr. Yoder (plant pathology), and Drs. Bergh and/or Pfeiffer (entomology). Horticultural topics will include predicting harvest maturity, pre-harvest drop control, and sampling leaves for nutrient analyses. These meetings are open to anyone who has an interest in commercial tree-fruit production. A full listing of the tree-fruit meetings being held in Virginia can be found by clicking on the Upcoming programs & events link on the Tree fruit extension and outreach website. Additionally, the International Fruit Tree Association (IFTA) is still accepting registration for the upcoming Study Tour in and around Adam’s County Pennsylvania. The organizers have put together a fantastic program and growers are highly encouraged to attend. The fifth Winchester Area Tree Fruit Meeting for the 2013 Season will be held this Thursday, May 30th at the Virginia Tech – Alson H. Smith Jr. Agricultural Research and Extension Center (Winchester Fruit Lab) at 7:00 p.m. with Dr. Tracy Leskey (USDA-Kearneysville) offering the program. Snacks will be provided. I hope to see you at the meeting Thursday. On Wednesday (May 15) starting at 11AM, we will have the next Rappahannock County In-Orchard meeting at William’s Orchard. And, on Thursday morning (May 16) starting at 7AM, we will have a breakfast meeting at the Winchester AREC with plant pathology, entomology, and horticulture updates. Meeting dates, times, and locations can be found at: http://www.anr.ext.vt.edu/tree-fruit/index.html by clicking on the “Upcoming Programs & Events” link on the righthand side of the screen. On Wednesday May 8, we will have a commercial fruit growers’ meeting at Saunders Brothers Orchards starting at 11AM. The meeting was requested by growers in the Central Virginia area to discuss fruit thinning, as well as current disease and insect management issues. For more information, please contact Michael Lachance at Lachance@vt.edu or 434 263 4035. There will be two commercial fruit grower meetings this week. On Tuesday (April 16) starting at 11:00AM, we will meet at Silver Creek Orchards in Nelson County to review current crop conditions and upcoming management decisions. On Thursday (April 18) at 7:00AM, we will meet at the Alson H. Smith, Jr. AREC for our first breakfast update meeting. Immediately following the breakfast meeting at the AREC, we will walk up the hill to view a Voen orchard covering system that was recently installed by Dr. Peck. The Voen covering was funded in part by a grant from the Virginia Agricultural Council. Future meeting dates and additional resources for tree-fruit producers can be found at the new Tree Fruit Extension and Outreach website.